The Nallamalai ranges of hills and forests extend all the way into Kurnool district of Andhra Pradesh. 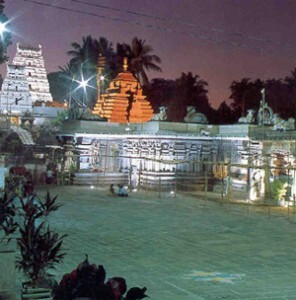 Amidst the thick forests lies one of the most famous temples in South India, the Bhramaramba Mallikarjunaswamy temple at Srisailam, 235 km from Hyderabad. The approach to the temple atop a range of hills is through thick forests. On the Rishabgiri hill on the south bank of the River Krishna is the temple housing one of the 12 ‘Jyotirlingas’ in the country. Srisailam is also the venue of an engineering marvel in the form of a hydroelectric project across the River Krishna and the reservoir created by it houses crocodiles. In fact, the Srisailam wildlife sanctuary comprises areas in five districts of the State and s home to tigers, panthers and several wild animals. The Tourism Department conducts package tours from Hyderabad and runs a guesthouse at Srisailam. There are buses to Srisailam from the State capital as well as other important centers in the State. This entry was posted in Andhra Pradesh, Srisailam. Bookmark the permalink.